Dempsey Essick’s first “Enjoy the Roses” miniature has proven to be one of the most popular small prints in the gallery. One of the most persistent requests is for a matching print to hang with the first as a matched set. “Enjoy the Roses II” is the answer to those requests. 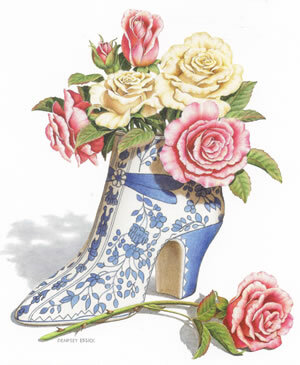 In an unusual ceramic vase shaped like a lady’s high heel shoe, Dempsey has arranged a few yellow and pink rose blossoms which are suitably enhanced by the blue decorative design on the vase. Sharp eyed viewers will spot a small hummingbird shape worked into the design. Dempsey is such a masterful painter of roses on visitor to the gallery was overheard saying that real roses would be jealous because they must drop their petals while Dempsey’s go on forever beautiful. Dempsey hopes you “Enjoy the Roses II” too.